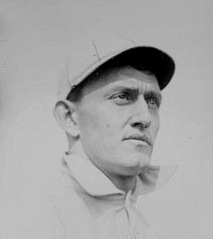 Clark Griffith repeated the story about how in 1892 he ended up in Missoula, Montana many times. 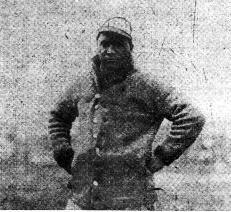 After the American Association disbanded, Griffith went west to join the Tacoma franchise in the Northern Pacific League. 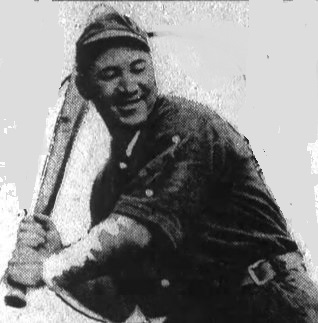 The team struggled financially, and after receiving an offer from a mining company, the entire team relocated to Missoula and joined the Montana State League. Griffith appears to have only once told a story about gambling, guns, and baseball in the mining towns of Montana that season. Great plays are in the eye of the beholder. 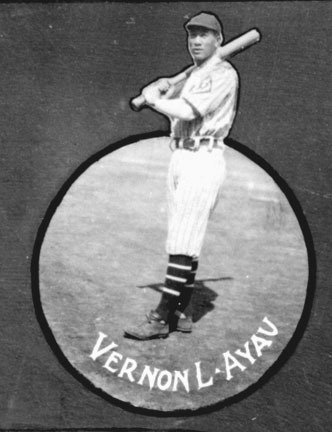 Jack Lelivelt said the greatest play he ever saw came in the greatest game he ever witnessed; the first game of a doubleheader played during the dog days of August by fourth and seventh place clubs hopelessly out of the American League pennant race. The game was a 1-0, 11-inning victory for the Senators; Walter Johnson getting the complete game victory over Doc White. And Lelivelt was not alone in his assessment. 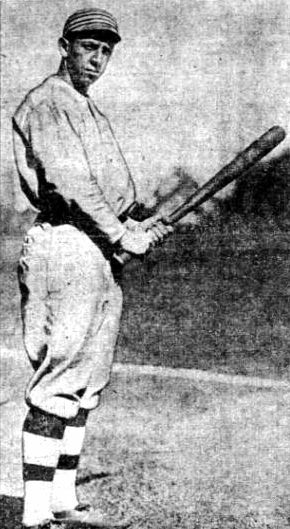 “(Jimmy “Nixey”) Callahan whipped a fast hit right down between third and short, a hit that seemed certain to go through to left field without being touched. 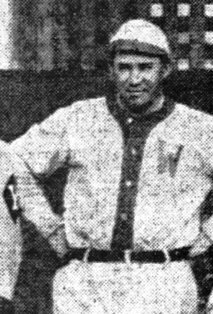 The ball was hit hard and was bounding rapidly when McBride went back and out as hard as he could, shoved down his glove hand, scooped the ball and snapped it straight into (William Wid) Conroy’s hands on top of third base. The play was so quickly made that McConnell saw he was out, and by a quick stop tried to delay being touched and jockeyed around between the bases to let Callahan reach second. He played it beautifully, but he never had a chance. McBride jumped back into the line and before McConnell could even get a good start back Conroy whipped the ball to McBride and McConnell was touched out before he had moved five feet. Curiously, the play Lelivelt said was the greatest in a game of great plays, the greatest play he said he ever saw, received no notice the next day’s coverage of the game in either Washington or Chicago. The Herald ran a column listing fourteen key plays in the game but failed to mention Lelivelt’s “greatest play” at all. The Post said only that McConnell was out “McBride to Conroy, on Callahan’s grounder.” It received no mention in the Chicago papers. 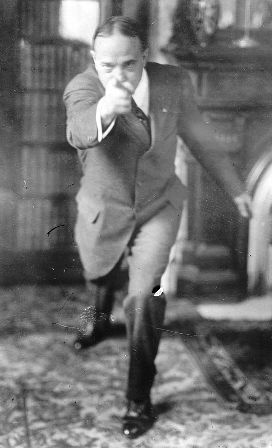 The Philadelphia Inquirer said in February of 1916, Eddie Collins of the Chicago White Sox, had broken “into the ‘Gospel League,’ after the second baseman gave a temperance speech in front of “500 persons” at the Epworth Methodist Church in Palmyra, New Jersey church. “Eddie Collins’ dip into evangelism has had a home-run effect among church people throughout the country, and he now is swamped with invitations to address church congregations, bible classes, and Sunday school meeting. 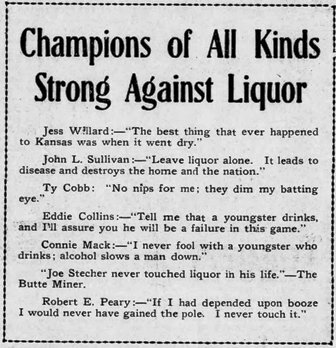 Collins’ statements about alcohol were used by various temperance organizations seeking prohibition. Ads like the one below with quotes from Collins, Ty Cobb, and Connie Mack, and Admiral Robert Peary, as well as boxers Jess Willard, John L. Sullivan, and Joe Stecher appeared in newspapers and handbills distributed throughout the country.